Quest B complex quick release is a gentle potency quick release formula providing a full spectrum of the B vitamins to support energy levels, the nervous system and psychological function. Vitamin B1, B2, niacin (B3), B6 and pantothenic acid contribute to the reduction of tiredness and fatigue. 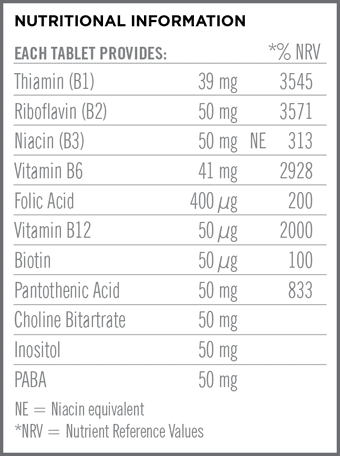 Vitamin B1, niacin (B3), B6, B12 and biotin contribute to normal function of the nervous system and normal psychological function. Take one tablet daily with a meal. Swallow with water. Di-Calcium Phosphate, Bulking Agent: Microcrystalline Cellulose, Pantothenic Acid, Vitamin B6 (methylcellulose), Riboflavin, Niacin (as niacinamide), Thiamin (methylcellulose), Choline Bitartrate, Para-Aminobenzoic Acid, Inositol, Magnesium Stearate, Vitamin B12 (di-calcium phosphate), Biotin (di-calcium phosphate), Anti-caking agent: Silicon Dioxide, Folic Acid (di-calcium phosphate), Glazing Agent: Hydroxypropylmethylcellulose.